Shine in our hearts, O Merciful Master, the pure light of Thy Divine knowledge, and open the eyes of our mind that we may understand the teachings of Thy Gospel; implant in us also the fear of Thy Blessed Commandments, that we, trampling down all carnal desires, may enter upon a spiritual manner of living both thinking and doing all those things that please Thee. For Thou art the Source of Light for our souls and bodies, O Christ our God, and unto Thy Eternal Father, and Thine All-Holy, Good, and Life-Giving Spirit, now and forever, and from all ages to all ages. Amen. On October 26th Our Holy Orthodox Christian Church commemorates, honors and entreats the holy intercessions of the following Saints, Forefathers, Fathers, Patriarchs, Prophets, Apostles, Preachers, Evangelists, Martyrs, Confessors, Ascetics and Teachers of Our Holy Orthodox Christian faith: The Holy and Great Martyr Demetrios the Myrrh-flowing of Thessaloniki. THE HOLY AND GREAT MARTYR DEMETRIOS THE MYRRH-FLOWING OF THESSALONIKI. This glorious and Wonder-working Saint was born in the city of Thessaloniki of well-born and devout parents. Begged of God by these childless parents, St. Demetrios was their only son and was, because of this, most carefully cherished and educated. His father was the military Commander of Thessaloniki, and, when he died, the Emperor made Demetrios Commander in his place. In doing this, the pagan Roman Emperor Maximian, an opponent of Christ, particularly recommended him to persecute and exterminate the Christians in Thessaloniki. Saint Demetrios not only disobeyed the Emperor: he openly confessed and preached Christ the Lord in the city. Hearing of this, the Emperor was furious with Saint Demetrios and, at one time, on his way back from a war against the Sarmathians, went to Thessaloniki especially to look into the matter. The Emperor, therefore, summoned St. Demetrios and questioned him about his Christian faith. Saint Demetrios proclaimed openly before the Emperor that he was a Christian, and, furthermore, denounced the Emperor's idolatry. The enraged Emperor cast him into prison. Knowing what was awaiting him, Saint Demetrios gave his goods to his faithful servant, Lupus, to give away to the poor, and went off to prison, glad that suffering for Christ was to be his lot. In the prison, an Angel of the Lord appeared to him and said: "Peace be with thee, thou sufferer for Christ; be brave and strong!" After several days, the Emperor sent soldiers to the prison to kill Saint Demetrios. They came upon the Saint of God at prayer, and ran him through with their spears. Christians secretly took his holy body and gave it burial, and there flowed from it a healing myrrh by which many of the sick were healed. A small church was very soon built over his holy relics. An Illyrian nobleman, Leontius, became sick of an incurable illness. He ran prayerfully up to the holy relics of Saint Demetrios and was completely healed, and in gratitude built a much larger church in place of the old one. The Saint appeared to him on two occasions. When the Emperor Justinian wanted to take the Saint's holy relics from Thessaloniki to Constantinople, a spark of fire leapt from the tomb and a voice was heard: "Leave them there, and don't touch!" and thus the holy relics of Saint Demetrios have remained for all time in Thessaloniki. 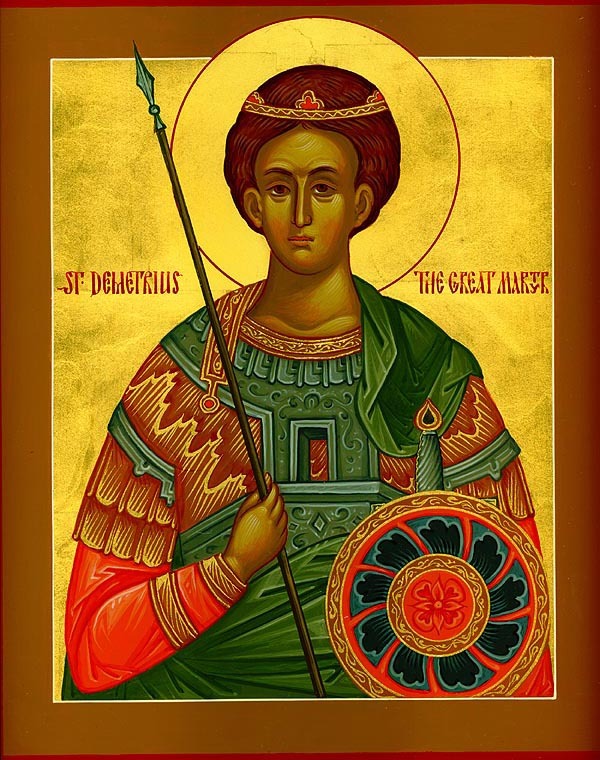 As the defender of Thessaloniki, Saint Demetrios has many times appeared and saved the city from calamity, and there is no way of counting his miracles. +By the holy intercessions of Your Saints and Great Holy Martyrs, O Christ Our God, have mercy on us and save us. Amen. Holy Epistle Lesson: 2 Timothy 2:1-10. A married man who had children, servants and plenty of wealth, was very merciful and hospitable. One evening after dinner, he slept and in the morning he was found lying on the ground, cold and unconscious as if dead. His relatives carried him to his bed giving him first aid and warming him to bring him back to consciousness. After many days, he recovered and was asked by his relatives to tell them what happened to him and where he was while he was as dead for so many days. He did not respond, only crying inconsolably and without ceasing and until his death he told nobody. When he was approaching his end he called his eldest son and told him this in front of everybody. My dear son, I give you this last commandment and order you to keep it strictly as much as you can. Be charitable to the poor and have a lot of affinity towards the strangers and travelers. Look after them in your home and with great love serve them willingly and give them generously, as much as they need as you saw me do until now. Because hospitality is the most welcome of all virtues by God, and receives great reward in the heavenly Kingdom. And to motivate you all my relatives for such God pleasing act of kindness and sympathy towards the strangers and the poor, this my last day I shall relate this amazing vision I had, when you found me as dead down on the floor of our house a few years ago. Know that from my early years I had great reverence for the Most Holy Theotokos and every day I would read her eulogies and blessings. For this longing and love that I had with all my soul and heart, the Despoti (Christ) blessed me through her intercessions to receive many gifts and graces, especially with love and giving generously whatever was needed. That night I had the vision, I heard a voice calling my name saying "Rise from bed and follow me". When I got up, the one that had called me grabbed me firmly by the hand, and brought me to a valley. He then disappeared and I, left alone and not knowing what to do, I suddenly heard behind me voices and disturbances. Turning back I saw a huge crowd of demons who were coming against me to grab me, as savage beasts. I, as soon as I saw them, I started running as fast as I could with incredible fear until I arrived at a house and after entering I closed the door. However, they broke the door and came in to grab me. To understand better, listen to this. It was now three years that I received a stranger in my house, from the evening of the feast of All Saints, to host as was our custom. Arriving at the house I met another stranger that was received by your mother according to my commandment to her, to receive and offer hospitality to everybody as if he were an Angel of the Lord, and soon your brother brought another one. I then tasted great happiness for having been blessed to receive and offer hospitality in my home to these three strangers similar to the type of the Most Holy Trinity. I offered them rich hospitality, as much as I could, according to my custom. When I returned therefore to my vision, the demons had come in and I started to cry to the Lord to have mercy through the intercessions of His Most Holy Mother. I then saw three good looking men who told me: "Fear not for we have come to help you". Having expelled the demons they asked me if I knew them. I replied "No, my Lords, I do not know you". They then replied, "We are the three strangers you offered hospitality with rich and Abrahamic heart and we were sent by our Lord to help you, and reward you for all the love you showed us and here you are saved from the demonic hands." Having said that, they disappeared. I thanked God and fearing to go outside in case they disturb me again, I remained in the house for a while. After a little while I crossed myself and went outside, hoping on the Lord. Having walked a little, I saw the demons running behind me saying, "Let us run now to catch him in case he escapes." I became afraid and running faster, I cried to the Theotokos, "Most Holy Theotokos help me". Thus running, I reached a flaming river, that was full of snakes, and other fearsome beasts of Hades. Their body was fully immersed in the flames and only their mouth was out, and open, as if they were hungry wishing to eat. The demons who chased me, were shouting for a possible different exit, when I saw a narrow bridge with one span and so tall that it looked to me to reach the sky. Not knowing what to choose between those three options, for example, to fall in the river where I feared the fire and the dragons, to submit to the authority of the demons that was worse, or to climb on the bridge. I chose the third. So I climbed the steps one by one with great fear and danger of falling in the fire. The cunning demons followed me with shouts and threats. When I got to the top of the bridge, the demons reached me and with tears I cried out to the Theotokos, "Most Holy Theotokos help me". Then in front of me appeared the compassionate Mother of mercy and she stretched her right hand saying, "Fear not my dear servant, because you used to read for me eulogies and prayers and loved the poor, the least brethren of my Son and my Despoti, that is why I came to help you in your need." Having told me these she held me by the hand and oh what a miracle! In one moment she brought me back to my house and my soul returned to my body, that you believed I was dead. For this my son do not neglect your service to the Mother of the Almighty God the All-Blessed Theotokos, but every hour to sing hymns to her and glorify her as you should and as I did, your father. This way you will have her as your helper in all your needs. This is my first commandment I recommend to you. The second is, as I already told you earlier, force yourself to love as much as possible the strangers, the poor, the widows, the orphans and give them whatever they need, if you wish to enjoy in the world everything good and to inherit the eternal Kingdom of God. The blessed one, having said to all those present, to venerate the Godmother and to help the poor, he delivered his soul in the hands of God. His son, remembering all his life the fatherly advices, he exercised a life of virtue and after the end of his earthly life, he was found worthy of the heavenly bliss.